Digging deep for a good cause could land one lucky person a special piece of commemorative memorabilia. 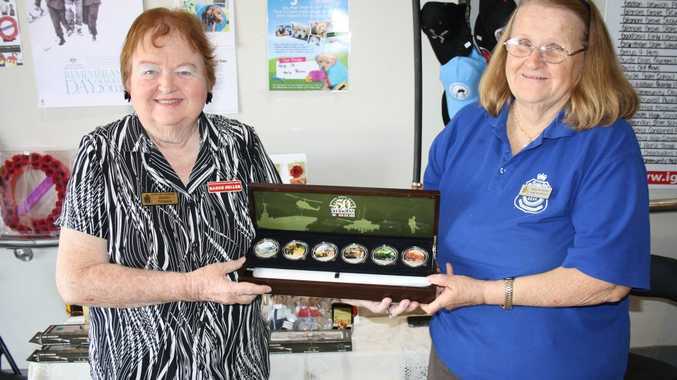 In the lead up to Remembrance Day this Monday members of the Laidley RSL are once again out and about selling a range of Remembrance Day items to help commemorate the day and to raise much needed funds. The Laidley RSL is also having a raffle this year with a special Vietnam War 50th anniversary edition box of six medallions up for grabs. The raffle will be drawn on November 12 with the person with the winning ticket notified on the day. Laidley RSL members Betty Northcott and Delma Tessmer will man the table in Supa IGA Gatton Thursday and Friday 8.30am to 5pm and on Saturday 8.30am to 1pm. Betty said the RSL had already given out 140 poppies to Lake Clarendon State School students to help commemorate the day for their service. Remembrance Day will be on Monday, November 11, with a number of services being held across the region. To help support war veterans and servicemen and women look for Betty and Delma this week.